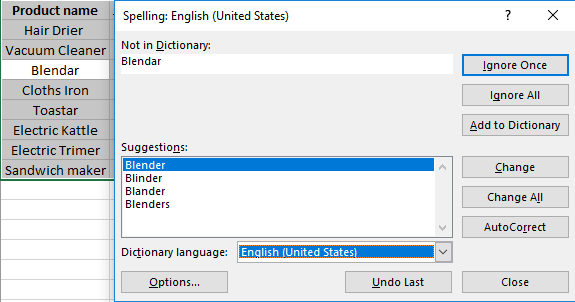 Spell checking is mandatory sometimes while working in an Excel Worksheet. 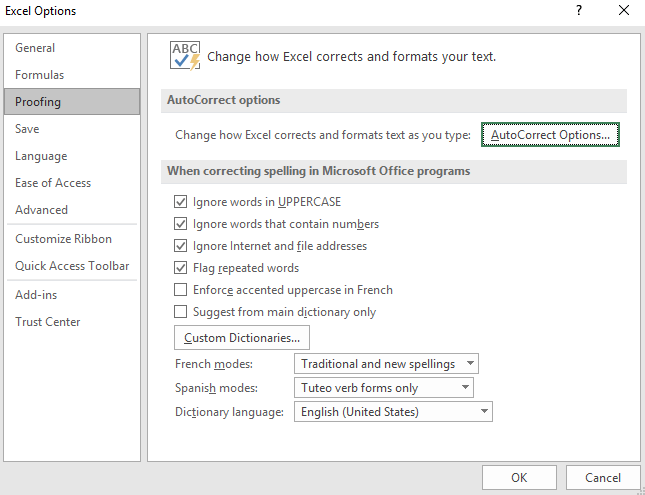 In this article, we will see how to perform a spelling check on the active worksheet of Excel. The methods are very simple. Along with the active worksheet, you will see the process for multiple and all worksheets. To perform the spelling check for multiple cells in your worksheet, first, select those cells where you want to perform the spell check. Now under the Review Tab select the Spelling option. Note: The Keyboard shortcut to open the Spelling dialogue box is F7. 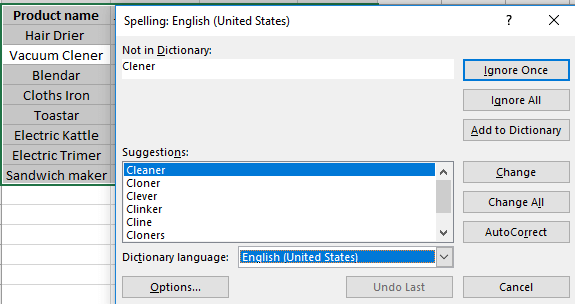 After selecting the Spelling option, you will see a spell checker box will appear. 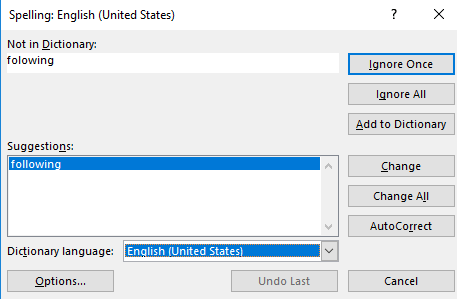 You can select your desired language under the Dictionary Language drop-down. In that box, you will also find the Ignore and Change options. In the suggestion option, you will see different words relevant to the word you misspelled. Usually, the most relevant words come at first. Select the word that you think is right and press on to the Change option. 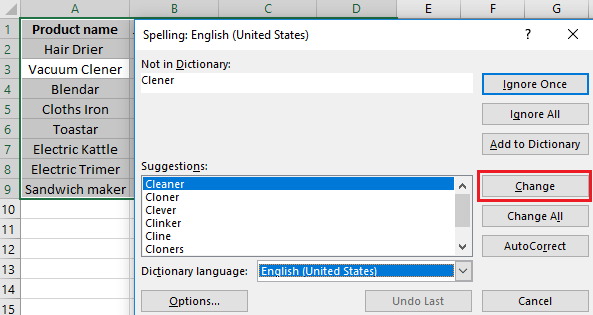 After selecting the Change option, you will see that the misspelled word which was “Clener” is changed into “Cleaner”. The same box will appear for the next cell. In this way, you can check the spelling for all the selected cells. The box will appear only for the cells where you have inserted misspelled words. After checking all the selected cells, you will get to see the below box appear in your worksheet. Press OK there to continue. To perform the spelling check for the entire worksheet select any cell of your worksheet and press on to the Spelling option under the Review tab. You can also press F7 which is the shortcut key for the spell check. In the beginning, you will get the below dialogue box. Press Yes there for continuing the spell check. You will get the same spell checker box as before. If your cell contains any formula Excel will not check the spelling for that specific cell. If you want to check the words in a formula, first select the words in the formula bar. Now, after selecting the word press on to F7 or select the Spelling under the Review tab. To check the spelling for the multiple worksheets. Select the worksheets manually while pressing the Ctrl button. After the selection is done you can choose the Spelling option under the Review tab or press the F7 button for spelling check. To select all worksheets of your workbook, select any worksheet and press on to the right button of your mouse. 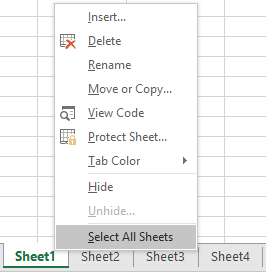 After doing this select the option, Select All Sheets. This will select all the worksheets in your workbook. Now to perform the spelling check do the same thing that is stated in the previous methods. While typing ‘shouldn’t’, ‘wouldn’t’, ‘couldn’t’ we often do the spelling or typing mistakes. To get rid of this kind of mistakes you can use the Autocorrect option. To select it, at first press on to the File tab and then select the Options tab. In the Proofing category select the AutoCorrect options. 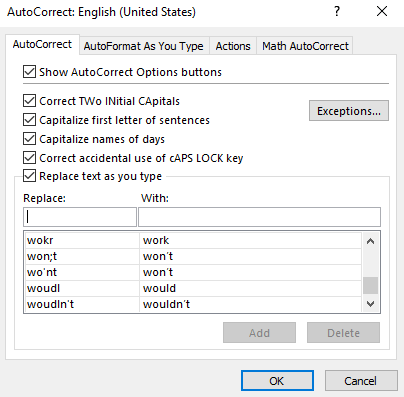 After selecting the Auto Correct options you will find the Autocorrect dialogue box from where you can replace different typing errors with the actual word. Let`s work with the word Wouldn’t. Suppose you accidentally misspelled this word as woudln`t several times in your worksheet. You realized your mistake and won’t want to do this in future. 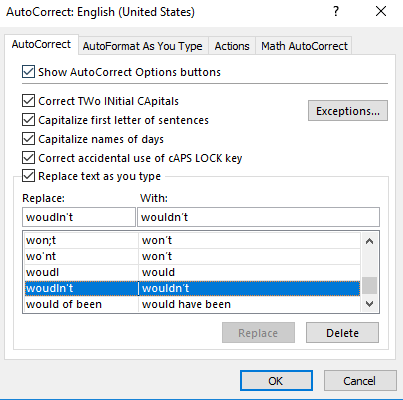 All you can do is to write the word woudln`t in the Replace section and select the actual word Wouldn’t in the With section. After pressing OK you will not see the result at first. 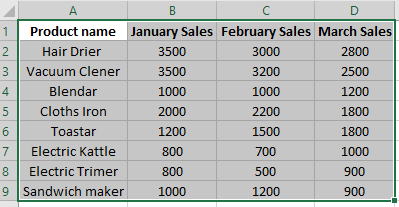 You have to select the cells where the misspelled words are located and edit the cells. 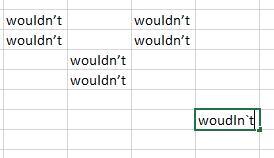 Now, if you again want to type the word Wouldn’t and accidentally type the word woudln`t, your worksheet will automatically correct the spelling. Now after pressing Enter, you will get to see the actual word. You can even use the Excel VBA code to check the spelling on the active worksheet. For this, select the Visual Basic under the Developer tab. In the blank space write down the below code. After running this code. You will see the Spelling dialogue box will appear. If your worksheet doesn’t contain any misspelled words you will not see the dialogue box. We will do the same coding with a slightly different approach. First, open the Visual Basic under the Developer tab. In the VBA Project listing double click on the ThisWorkbook. Now select the BeforeClose option in the module. You will get to see a code appear in the module. Now insert the code Sheet1.Cells.CheckSpelling in between them and save the workbook as “Excel macro-enabled workbook”. Now just before closing the workbook, you will see the Spelling dialogue box appear in your worksheet. The code that we are actually using is given below. As you can see the process of checking the spelling in Excel is very simple and doesn’t require so many steps. It is easy and fun. Hopefully, after reading this article you will not have any doubts regarding the spell-checking process in Excel.